Home » WOD Blog » Fell Deeds Awake! EIEC Tip of the Day: Most people have 5 to 6 things they love to eat, paleo or not. When starting paleo it took me about 2 weeks of experimenting with everything to find my 5 to 6 things. It will happen before you know it, and learn to lean on those things when you need to. Notes: Take time to practice more advanced skills and work on progressions to get better at weaknesses. This can include different anchors on the rope, legless rope climbs, deficit HSPU, kipping HSPU, and butterfly pullups if comfortable with the gymnastic kip. 7 Knees-to-Elbows (knees must come in full contact with elbows for rep to count)? So I was going to write a post extolling the virtues of signing up for the Open and how awesome Friday Night Lights are going to be, but the Titan McCoy went ahead and blew that out of the water with his excellent post yesterday. So I’m going to keep it simple and ride the calm before the storm. 2. I want to crush the 165 lbs snatches. 3. I hope everyone crushes it at Friday Night Lights, where we will awaken Fell Deeds! If you were here at all last year, or even if this is your first time competing, please post your first instinctual thoughts to comments. I’ll leave it with a quote from CrossFit CEO and Co-Founder Greg Glassman, one of my mentors from afar, on the purpose and uses of CrossFit. Diso and I had a great conversation about how CrossFit serves people’s lives and the future of physical culture for humanity (not kidding.) Over the years I’ve seen an almost divisive issue on using CrossFit to make you better at your chose sport/pursuit versus choosing CrossFit AS your sport/pursuit. I am not of the mind that it has to be one or the other. CrossFit is what it is to you. 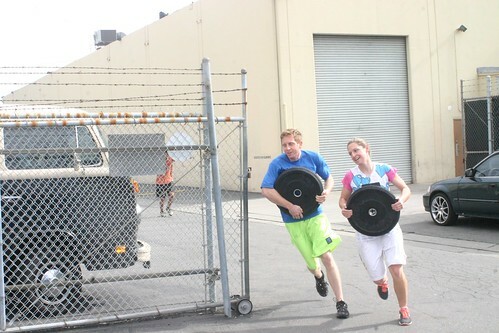 “The WOD can be worked to accommodate additional sport training and practice. For these athletes integrating the WOD on top of their primary sport interest requires careful and deliberate modulation of the WOD’s intensity so as not to marginalize the efficacy of their sport training. This is not easy, but many have done so brilliantly. Others have not learned to establish consistency before turning up the heat and some of them have gone down in flames. Other athletes are only casually interested in sport but perfectly committed to maximizing their fitness. For these athletes fitness training is their sport. In both cases the WOD well meets their needs for cardiorespiratory endurance, stamina, strength, speed, and power. Those athletes participating extensively in sport are largely developing additional agility, coordination, balance, accuracy (and sometimes flexibility) through that additional sport training. The metabolic demands of the WOD can be so intense that only by toning down the WOD can additional work be accommodated. For the athlete whose sport is fitness training they can further their development by putting in extra work with moderate to low metabolic cost and high neurological demands. The supplemental tips, skills, and drills will largely serve the role of sport training (as opposed to strength and conditioning) For these athletes the supplemental work proposed/promised is tantamount to some gymnastics practice before or after the WOD.